Trainer Peter Snowden admits that Smartedge will need plenty of luck after drawing a wide barrier in the $2m Magic Millions 3yo Guineas (1400m) at the Gold Coast on Saturday. Tye Angland, above, rides Smartedge in the 2018 Magic Millions 3yo Guineas at the Gold Coast. Photo by Daniel Costello. Snowden, who trains in partnership with his son Paul, can see Tye Angland settling Smartedge in the second half of the field after drawing barrier seventeen in the original draw in the field of sixteen plus two emergencies. Both of the emergencies have drawn inside of Smartedge who will probably jump from fifteen when the final field is reduce to sixteen at start time. “The barrier draw isn’t ideal but he’s one that will look to get off heels and do his best work late so we can still look forward to a good showing,” Peter Snowden said. Smartedge is the winner of two of his five race starts and Snowden can see plenty of improvement in the Smart Missile gelding who is coming off a last start second in a 1400m BenchMark 74 Handicap at Randwick on January 1. “His run was good the last time. He’s a big galloping horse and he just got beaten by one that had the run on him off a slow pace,” Snowden said. Smartedge is marked at $19 with Ladbrokes.com.au while the Greg Hickman trained Pierata sits at the top of the market order at $2.45 for the Magic Millions 3yo Guineas. 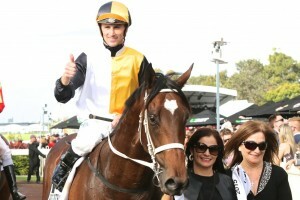 Melbourne Cup winning jockey Corey Brown is certain to give Pierata the run of the race from barrier one and the Pierrio colt looks the one to beat coming off a last start win in the Group 3 $200,000 Vo Rogue Plate (1350m) at Doomben on December 30.